When Should You Have Your Tie Rod Replaced? What Is Done during a Tie Rod Replacement? How Much is a Tie Rod Replacement? For a tie rod replacement, you will generally pay around $70 to $200 for parts and labor. Here’s the breakdown for you. The tie rods don’t take long to replace, so labor is only going to run you between $30 to $100 for most cars. Your car’s make and model will cause the price to go up or down according to how difficult the replacement process is. The parts will normally be between $20 and $100. Once again, the kind of car you have will determine the cost. More expensive cars tend to have more expensive parts. Below are some sample costs for parts and labor from some of the leading repair shops in the country. The cost of repair will vary depending on your brand of car and how much your own mechanic charges for labor. Your car’s steering and alignment are partially controlled by tie rods. These small rod contribute to the steering system and they keep your tires aimed in the right direction. Once they start to malfunction, your car may not control the way it should anymore. If your tie rods have been malfunctioning for a while, they can cause additional stress on many other parts of the steering system. Over time, that creates damages that can be expensive to repair. So the sooner you have your tie rods replaced, the less expensive the repairs will be. Tie rods are essential to your car controlling like it should. Once they start to go, your car isn’t going to handle very well. We’ll cover what things you should look out for in the next section, but just know that if you don’t keep your tie rods in good condition, then you will not have a very pleasant driving experience. It can even become downright unsafe to allow your tie rods to remain in poor condition. Keeping your tie rods in great shape ensures that your car and the tires in particular are going to last a while. When the tires get out of alignment, and they will if your tire rods aren’t working right, then you will see abnormal wear and tear on the tires. 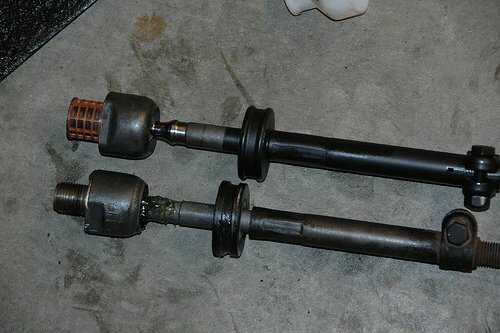 By replacing your tie rods at the right time, you can avoid a lot of that damage and save yourself some money. If you notice any of these problems, you should have your tie rods and steering system checked out. Of course this is the kind of car part that should be inspected during regular tune-ups. If your mechanic tells you that the tie rods are starting to look worn or may need replacing, then you should definitely have this rather inexpensive and simple repair done right away. The longer you wait to have it done, the more damage your car will experience. This is a simple automotive maintenance procedure that should not be overlooked. The tie rods are quick and easy to replace, but it may not be so inexpensive to replace your tires and other parts that can be affected by bad tie rods. As with any car repair work, your mechanic should first check to see what exactly is the problem. Even if your car is exhibiting all the signs that tie rods are at fault, it could be a another related issue causing the problems. Once the mechanic has determined that the tie rods need to be replaced, he will take off the road wheel. Then he will remove the old tie rods or tie rod ends and install the new ones. Most of this can be done with a variety of wrenches. After the new tie rods are in place, the mechanic will inspect the steering and suspension systems for any other problems. He will be looking specifically for parts that are heavily worn, which can happen when the tie rods are not doing their job. The mechanic will also grease the rods to allow them to rotate smoothly. Then the mechanic will place the wheels back on test drive the vehicle. He will be checking for proper steering and handling. He may also perform a tire alignment if necessary, as the tie rods can cause the tires to go out of alignment when they are malfunctioning. Because there are no expensive or hard to get tools required for this job, it is something that just about anyone can do. You will want to make sure that you are experienced at replacing tie rods or follow the instructions of someone who is (perhaps even using an instructional video), but this is a fairly simple process, and it should give you a lot of trouble if you want to cut cost by doing the work on your own. That said, this is a fairly inexpensive repair job, and it may benefit you to just leave it to a professional. But your best way to save money on it will be to have it done as soon as you know there is a problem. The longer you want it get your tie rods replaced, the more damage your car may suffer from. Catching the problem early is going to save you a lot of money. While replacing the tie rod is not a particularly time-intensive job, there can be a variance in prices when you factor in the cost of the parts from different manufacturers. Below are some sample costs for the repair on some popular car models.